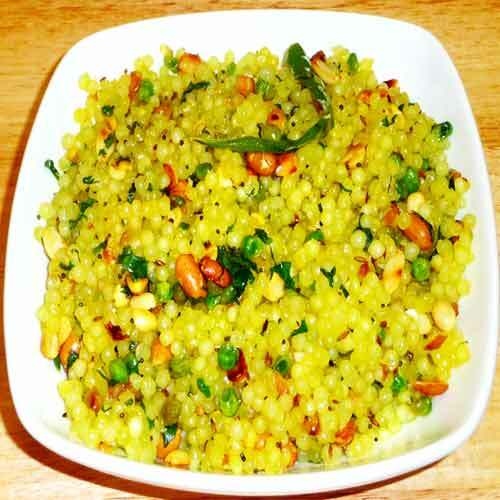 Sabudana upma, also known as sabakki upma, saggubeeyam upma, sago upma, and javvarisi upma, is easy to make. Take a non-stick Karai and put it on the flame. Put sago in it and roast it lightly. Just heat it but don't change its color. Soak sago in a utensil. Fill as much water as they can submerged easily in it but be careful that water should not float on it. Soak it for 5-6 hours. Sago will soak this water in the 5-6 hours. Spread it with your hands. If you will soak roasted sago in the water they do not stick with each other. Now it is ready for Upma. Cut boiled potatoes in the small pieces. Grind peanuts and make them coarsed. Cut green chillies and ginger in the small pieces. Put oil in the Karai and when it heats then add Kari leaves and ginger in it. Add green chillies, Sabudana and half spoon salt in it. Cook it on the fire for 5-6 minutes. Do not fill water in it. When it cooks then add coarsed peanutes and boiled potatoes in it. Your Sabudana Upma is ready, squeeze one lemon in it and garnish with the coriander leaves.